Students in Mr. Linen's 6th grade social studies class have been writing pen-pal letters to a class in Atlanta, Georgia, who are learning Spanish. The students from Bunche Middle school get to practice their Spanish with our own native-speaker students, and Mr. Linen's class explores current events and politics, with views from the (mostly) African-American 7th graders. Almost a full year of writing letters culminated in May, with a Google Hangout with the two classes. The students from Bunche MS got to speak to their pen pals live and in person, ask basic questions, and give answers about their own lives. Our students also had the opportunity to ask about their opinions on topics ranging from Donald Trump and his border wall, to North Korea and their nuclear plan, and the general opinions about Mexicans in the United States. Both groups immensely enjoyed the experience, and look forward to maintaining contact in the future. Students in both libraries have been exploring the possibilities of the Makey Makey device. This invention kit connects everyday objects with computer programs by turning them into touch pad input devices. 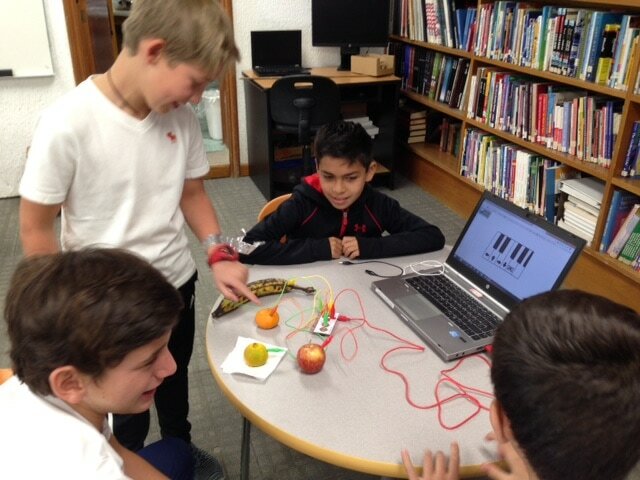 On Children's day, elementary students experimented with using the Makey Makey to create and play a "fruit piano". They were asked "How do you think this works?" Most correctly guessed that electricity was involved, although some thought it was somehow internet-related. On Maker Thursday in the Upper School library, the middle school students expanded the idea of the fruit piano, using each friends' hands, arms, and faces to play not only piano, but also bongos and Tetris. They often came up with their own questions, like "How many people can be holding hands and still pass the charge?" and "Will my shirt conduct the current if I soak it with water?" or "What happens if we put all the clips in the banana at the same time?" Fifth through Eighth grade students spent Maker Thursdays in February building simple machines (levers, pulleys, etc) and moving on to motorized machines using a new LEGO activity pack which includes ropes, pulleys, gears, crankshafts, and electric motors. Some chose to follow step-by-step instructions, while others chose to creatively put together a moving vehicle, with varying degrees of success. These 'toys' allow kids to see the relationships between force and motion, a great introduction to physics. ​During Maker Space time in the lower school library, all elementary students had the opportunity to explore using the Spheros. They learned how to drive them around a track using the ipad as a remote control. After this initial familiarization session, they will be ready to program these robotic balls to maneuver around the course at a later date. For Maker Thursdays during December, a group of students studied the basics of 3-D design and 3-D printing. Using the software Tinkercad, students explored how objects occupy all three dimensions, and how they could manipulate those forms to create holiday ornaments. After discussing how the 3-D printer creates objects by layering melted plastic filament, the students evaluated their designs for printability. If the designs proved sound, we tried to print them. In the end, several students were able to 3-D print their objects, and take them home for the holidays. Lower library Maker Space activities focused on animation in November. 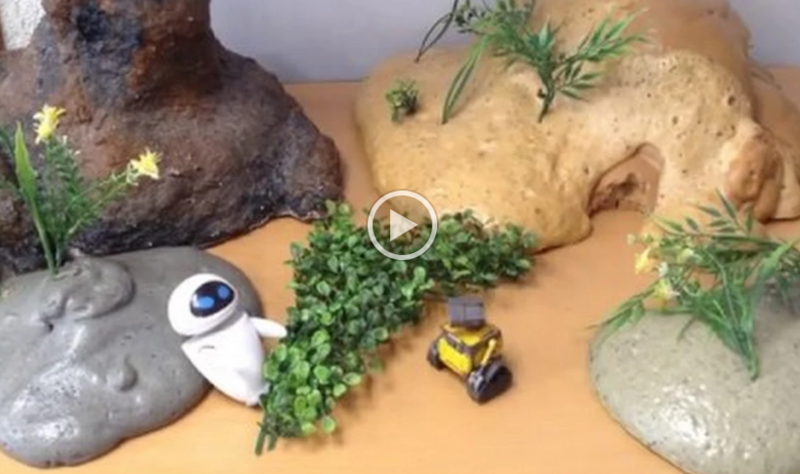 3rd graders learned how to use the Stop Motion app on the iPads to create a short animation of toys or clay figures. During October in the Upper School Library MakerSpace, students have been learning the basics of computer programming (and having a blast at the same time). Using the Sphero robots and the Lightning Lab programming app, students called upon their creativity to overcome several different challenges. At first, they programmed the robots to make different geometrical shapes--circles, squares, triangles, then graduated to navigate a tricky obstacle course. To conquer the course, students drove the robots through the course manually first, then created programs to guide the Spheros through automatically. From observing, making corrections, and manipulating variables over multiple tries, students used their problem-solving and creativity to meet the challenges--and learned a little computer coding along the way. The lower library MakerSpace was piloted by elementary students in library class during September. They were given a choice of electricity kits to explore- Snap Circuits and LittleBits. In the LittleBits challenge, students had to create a LittleBits circuit using a switch to turn on and off the light, fan or buzzer, after which they were invited to install it in the toy house. 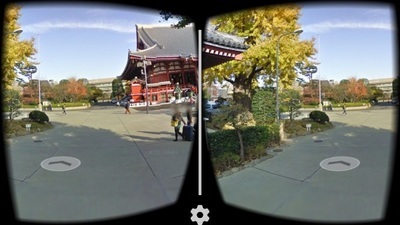 This last stage helped the students to understand the real world connection of this technology. 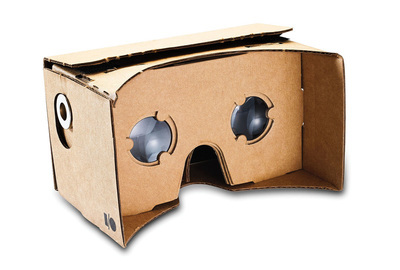 Students have been exploring Google cardboard in the elementary library. 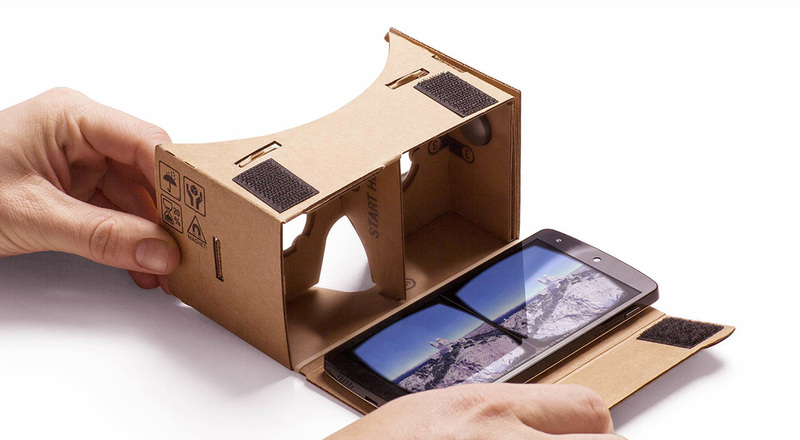 By placing a mobile device in the cardboard viewer and using the Google Cardboard app, the viewer can experiment with virtual reality. 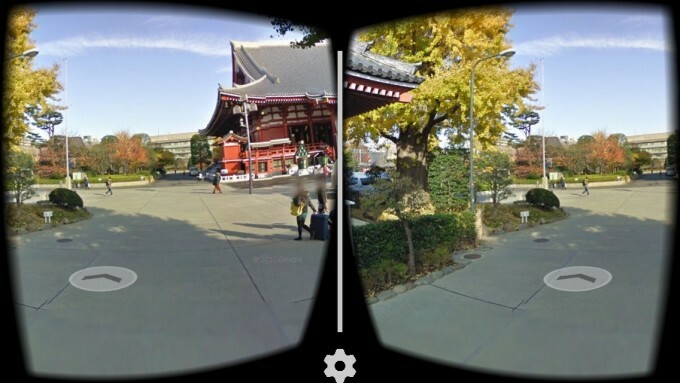 ​During elementary Open House night, several students were excited to use the Google Street view Cardboard option to give each other a tour of their home country - India, Korea and Scotland. 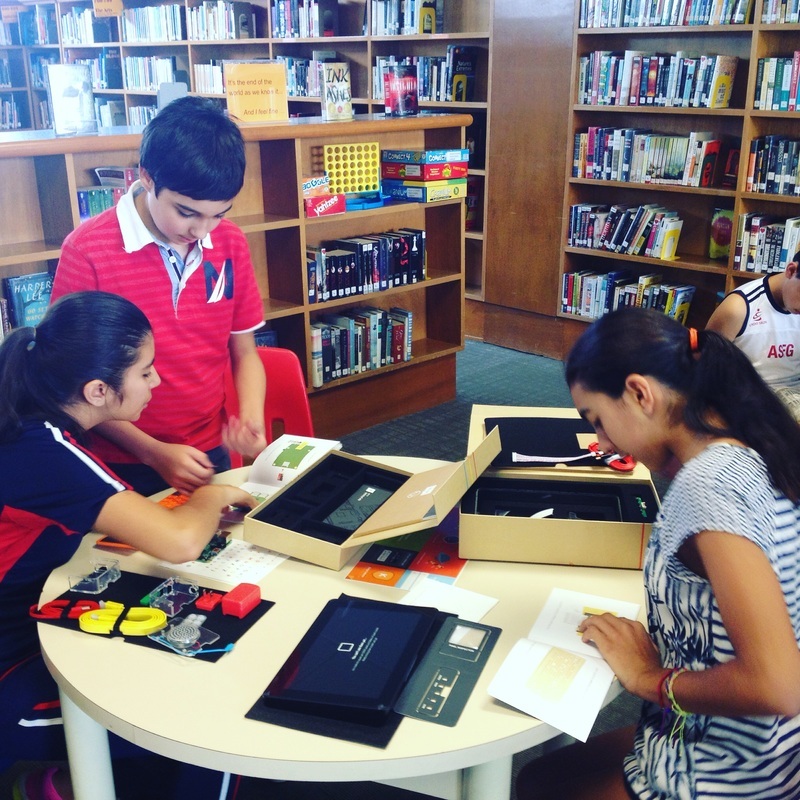 A group of 5th and 6th graders built a Kano computer in the upper library. The Kano computer and display monitor are unique in that they are put together like a puzzle using pieces that resemble Lego parts. The computer can be disassembled and put back together over and over again, and can thus be used as a learning tool by many groups. Once the computer is assembled, students may use it to code and/or explore educational apps. The computer is even WiFi enabled. Some of the students are joining the Kano community of student coders and learners to collaborate on projects and to share ideas. The Kano reflects the upper school library's philosophy as a learning and creation commons.